ZHŪ Bólú 朱柏卢 is the hào 号 or “friends’ name” given to Zhū Yòngdūn 朱用钝. Zhū lived in the Kūnshān Xiàn 昆山县 district of Jiāngsū 江苏 Province from 1617 to 1688. His father, Zhū Jíhuáng 朱集璜, had been a rural scholar during the chaotic collapse of the late Míng 明 dynasty and led a group of vigilantes to defend the Kūnshān community against wandering bands of brigands. Zhū Bólú had passed a Xiùcái 秀才 examination under the Míng régime and was well on his way to an official career, but the dynasty collapsed when he was in his 20s, and so he spent most of his life as a rural schoolteacher and geomancer. In that role, he gradually attained local fame for his learning and morality, and under the Qīng 清 dynasty Kāngxī 康熙 emperor (reign 21a, 1662-1722) he was invited to serve as a local official, but declined to do so, presumably out of loyalty to the fallen dynasty. Zhū’s writings included several volumes of essays and commentaries on the Confucian classics. None came anywhere near attaining the fame of the stubbornly Confucian “Maxims for Managing the Home,” presented here. 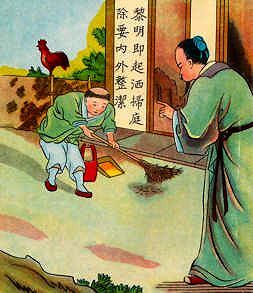 "Zhū Bólú's Maxims for Managing the Home" 朱柏卢之治家格言 was prepared with the intent to spread morality like jam over the land, and Zhū came to be called "Master Zhū" (朱子). Hence the text is also popularly called "Master Zhū's Maxims for the Home." (朱子家顺). Today it is one of the most commonly reprinted of the classical popular morality tracts. Copies are frequently distributed free in temples, but it is also typically included as an appendix to almanacs, or in small collections of morality literature. On the other hand Zhū also counsels honesty, generosity, and fair dealing, which goes to the heart of Confucian civic responsibility (although not exactly jolliness). Zhū’s maxims, taken together, constitute a surprisingly full representation of how traditional China held that an ideal family head and his family should behave. The lingering popularity of the work suggests that even in the XXIst century, the maxims continue to attract interest, not just as an historical document, but as the outline of a commendable way of life. Límíng jí qǐ sǎsǎo tíng, chú, yào nèiwài zhěng jié. Jì hūn biàn xí. Guān, suǒ ménhù, bì qīn zì jiǎndiǎn. Yì zhōu, yí fàn, dāng sī láichù bú yì. Bàn sī, bàn lyǔ, héng niàn wù lì wéi jiān. Yí wèi yǔ ér chóumóu. Wú lín kě ér jué jǐng. Zì fèng bìxū jiǎnyuē. Yàn kè qièwù liúlián. Qìjyù zhí ér jié wǎfǒu shèng jīn yù. Yǐn-shí yuē ér jīng yuán shū yù zhēn-xiū. Wù yíng huá wū. Wù móu liáng tián. Sān gū, liù pó, shí yín-dào zhi méi. Bì měi, qiè jiāo, fēi guīfáng zhi fú. Qī, qiè qiè jì yàn zhuāng. Zǔzōng súi yuǎn, jìsì bù kě bù chéng. Zǐ, sūn súi yú, jīngshū bù kě bù dú. Jūshēn wù qí jiǎnpú. Jiào zǐ yào yǒu yì fāng. Wù tān yìwài zhi cái. Mò yǐn guòliàng zhi jiǔ. Yǔ jiān tiǎo màoyì wú zhàn piányí. Jiàn pín-kǔ qīn-lín xū duō wēnxù. Kèbó chén jiā lǐ wú jiǔ xiǎng. Lúncháng guāichuǎn lì jiàn xiāowáng. *- Human Relationships: The relationships in question are the usual "five relationships" (wǔlún 五伦), viz. prince-minister (jūn-chén 君臣), parent-child (lit: father-son) (fù-zǐ 父子), husband-wife (fū-fù 夫妇), older & younger siblings (lit: brothers) (xiōng-dì 兄弟), and friend-friend (péng-yǒu 朋友). Xiōngdì, shúzhí xū fēn duō rùn gǔa. Zhǎng-yòu nèi-wài yí fǎ sù, cí yán. Tīng qī yán, guāi gǔ-ròu, qǐ shì zhāngfū? Zhòng zīcái, bó fùmǔ bù chéng rén zǐ. Jià nyǔ zé jiā xù, wú suǒ zhòng pìn. Qǔ qī qiú shú nyǔ, wú jì hòu lián. Jiàn fùguì ér shēng chǎnzhóng zhě, zuì kě chǐ. Jiàn píngqióng ér zuò jiāotài zhě, jiàn mò shèn. Jūjiā jiè zhēngsòng, sòng zé zhōng xiōng. Wú shì shìlì ér língbī gū, guǎ. Wú tān kǒufù ér zì shā shēng, qín. Guāipì, zì shì huǐwù bì duō. Tuíduō, zìgān jiā dào nán chéng. Xiánì èshào jiǔ bì shòu qí lèi. Qūzhì lǎochéng jí zé kě xiāngyǐ. Qīngtīng fāyán zhī fēi rén zhi zànsù? Dāng rěnnài sān sī. Yīn shì xiāng zhèng, ān zhī fēi wuǒ zhi bú shì? Xū píng xīn zài xiāng. Shīhuì wù niàn. Shòu ēn mò wàng. Fán shì dāng liú yú dì, dé yì bù yí zài wǎng. Rén yǒu xǐqìng, bù kě shēng jídù xīn. Rén yǒu huòhuàn, bù kě shēng xǐxìng xīn. Shàn yù rén jiàn, bú shì zhēn shàn. Èkǒng rén zhī, biàn shì dà è.
Jiàn sè ér qǐ yín xīn, bào zài qī nyǔ. Nìyuàn ér yòng ànjiàn, huòyán zǐ-sūn. Jiāmén héshùn, sūi yōngsūn bú jì, yì yǒu yú huān. Guókè zǎo wán, jí nángtuó wú yú, zì dé zhì lè. 50. In study one should aim at [the level of] the saints and worthies, not merely at a degree. Dú shū zhì zài shèngxián, fēi tú kēdì. Wéi guān xīn cún jūn, guó; qǐ jì shēnjiā? Shǒu fèn, ān mìng. Shùn shí, tīng Tiān. Wéirén ruò cǐ, shùhū jìn yān. 1985 Zhū zǐ jiā xùn. 朱子家訓。 Taipei: 世紀書局. Zhūzǐ jiā xùn géyán báihuà jiěshuō. 朱子家訓格言白話解說。 Kaohsiung: 慶芳書局. Zhūzǐ jiā xùn géyán. 朱子家訓格言。 Fengshan: 世峰出版社.